“I didn’t know where the next punch was going to come from,” said one trans woman. Photo: PA/PA Archive/PA Images. All rights reserved. Critics say Twitter’s words aren’t met by action. 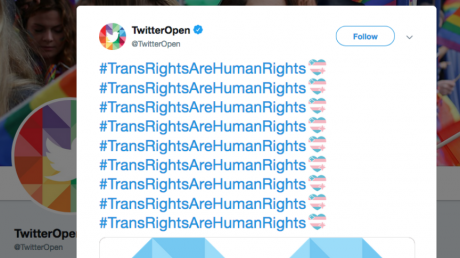 Photo: screenshot of one of Twitter’s own accounts posting: #TransRightsAreHumanRights.Like other platforms, Twitter has a policy against ‘hateful conduct’ that targets people based on characteristics including gender identity. It also does “not allow accounts whose primary purpose is inciting harm towards others on the basis of these categories”. But, like other platforms, it relies on users to report content that violates its rules. "We care deeply about the LGBT community on YouTube”, they said. “We remove videos violating these policies when flagged by our users". “There is nothing in my videos which is hateful content”, she added. Unlike Twitter, she said, “YouTube don’t seem to have the same issues or same need to censor... but it may be I haven’t come to anyone’s attention”. "There is nothing in my videos which is hateful content"
Frequent posts, he said, “make horrendous personal comments about her appearance and style of dress... essentially sexually objectifying her”. 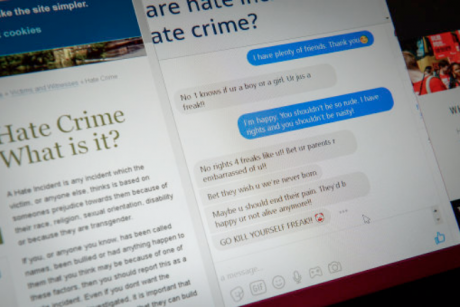 In a statement, Mumsnet’s CEO Justine Roberts explained that its moderators are “likely to delete misgendering, the term 'trans-identified male'”, and “sweeping negative generalisations about trans people”.